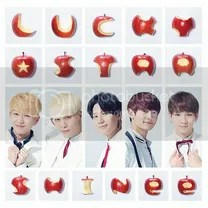 LUCKY STAR is the tenth Japanese single by Korean boy group SHINee, released on June 25, 2014. The single peaked at #2 on the Oricon Charts and has sold 35,837 copies to date. Finally a new single from SHINee! LUCKY STAR is their Summer single of this year filled with funky guitar riffs, piano, strings and pumping beats. This song just screams fun and I love how all the boys get to show off their vocals in this song. Even Taemin, whose vocals I dislike most, comes out great. Minho’s rap spices up the second verse and Onew, the leader that he is, probably delivers the best vocals. I think I can’t get this track out of my head for quite some time. Bounce is the big surprise of the single because it has its fair share of brass instruments, something you don’t hear often in SHINee’s songs. Another special treat is the bigger role for Minho and Key, singing instead of rapping. This song is the perfect B-side for the fun A-side since they both share that fun and uplifting quality. I like “Bounce”! It’s really a different song from SHINee, like a song you’ve never heard from them, I like the jazziness 🙂 What’s with SHINee on this single, though? xD They had an oldies feel for this one, which is kind of cool. Not a fan of Lucky Star, though…didn’t do anything for me.